I am in the magazine “Discover Japan” with the article of the opera performance. Thank you. My new piece Filigree for flute, recorder and cembalo will be performed by Ensemble Airborne Extended on 6th March 2019 in Aarhus, Denmark. My new piece “Ma” will be performed by the fantastic recorder player Kirsten Aage and the singer Helle Thun on 24th of February at the beautiful museum Glyptoteket in Copenhagen, Denmark. The new version of my piece “Pointed toe” will be performed by the member of Ensemble reconsil in Reaktor on 23rd of October 2018. HERE! My first improvisation piece called “Cello-Go-Round” will be performed in the concert “Klangreise” in Allegro Vivo Chamber Music Festival,the music festival in Austria on 8th September. 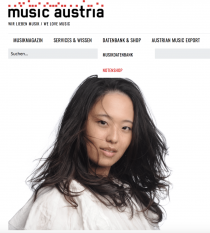 I got interviewed by Music Austria about Artist in Residency which I participated in from April to June 2018. I’m so happy to share this event with all of you! My brand new piece “Rock ‘n’ Roll” will be performed by this coolest guitarist in his final concert in Royal Danish Academy of Music on 20th of June. I’m selected to the artist in residency organized by Austrian Federal Chancellery and KKA and I’m staying/working in Vienna in this spring from 4/4 – 29/6. オーストリア政府文化庁給費芸術レジデンスの今年の作曲家として選出されました。4月より三ヶ月間オーストリア、ウィーンにて制作、活動を行います。 HERE! I am so honoured to announce that my opera “Skyggen by Aya Yoshida” was awarded by Danish Arts Foundation for The best 10 music publishing/releasing of this year. Thank you very much.